Kitchen is perhaps the only utilitarian room where we spend so much time, and especially housewives. If we talk about the case of connecting the kitchen and dining area, so this extremely functional room becomes a haven for the whole family. Such spaces endowed with increased functional load need the appropriate interior. No wonder the whole world designers do not cease to invent new kinds of finishes, furniture, arrangement of working and auxiliary areas for kitchens. There are an increasing number of modern kitchen gadgets that can greatly facilitate routine work and complicated cooking processes, piling, sorting, cleaning and disposal. However, our publication will be devoted exclusively to the aspects of natural or artificial stone kitchen interior decoration ideas of modern premises for cooking and eating. Any homeowner knows that the natural stone is the most durable, reliable and strong material. it is ideal for decoration of premises with high humidity, sudden temperature changes and high mechanical loads. Caring for the surface of the stone is not difficult, it can withstand not only the excess moisture, but also exposure to chemical cleaning agents. 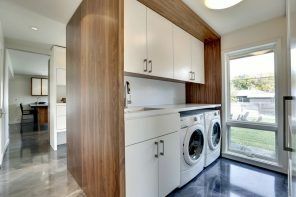 Not to mention the aesthetic side of the issue and the possibility to change the look of a kitchen interior radically. Let us consider the possibility of the successful integration of stone surfaces in the modern style of kitchen spaces in more detail. 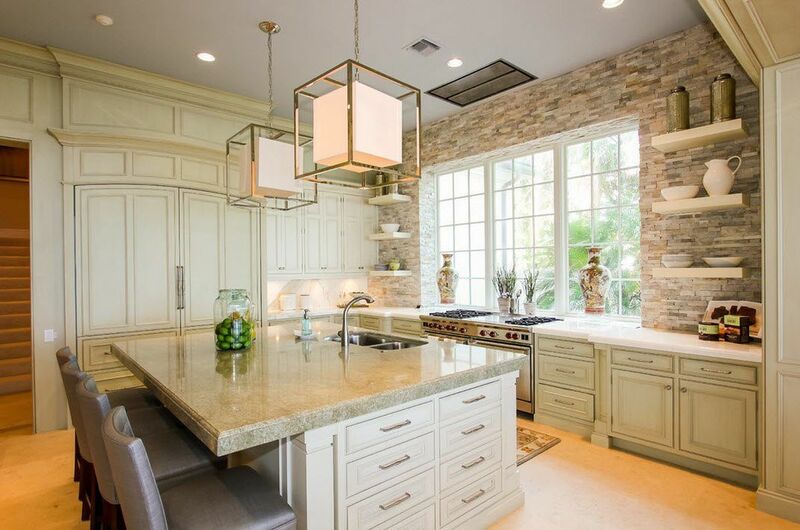 We hope that the impressive selection of kitchen design projects, which finishing actively involved natural or artificial stone, will help all homeowners who have decided to make renovation using stone facing in suburban or urban kitchen. The most common variant of the integration of the masonry into the interior of a modern kitchen is facing surfaces of the plate in a fireplace or stove. This is a spectacular way to draw attention to one of the most important instruments of the kitchen space and work area above it. Natural stone, which faced the space above the stove have instantly changed the appearance of the classic kitchen, bringing not only brutal attitude, but also an element of country life, a moment of closeness to nature and its materials into the interior. The combination of stonework and wooden surfaces, objects of furniture is one of the most common methods of interior decoration in country style. These two natural material are literally created for mutual communication and collaboration in modern arrangements. The wood, with its natural warmth, and stone bringing cool are mutually compensate and complement each other. In this universal kitchen there is a real stone oven in addition to the imitation of fireplace space above the stove. Light gray palette of stone perfectly harmonizes with wood-beamed ceilings, and purple-crimson color of the kitchen cabinets appears as accentual contrast. 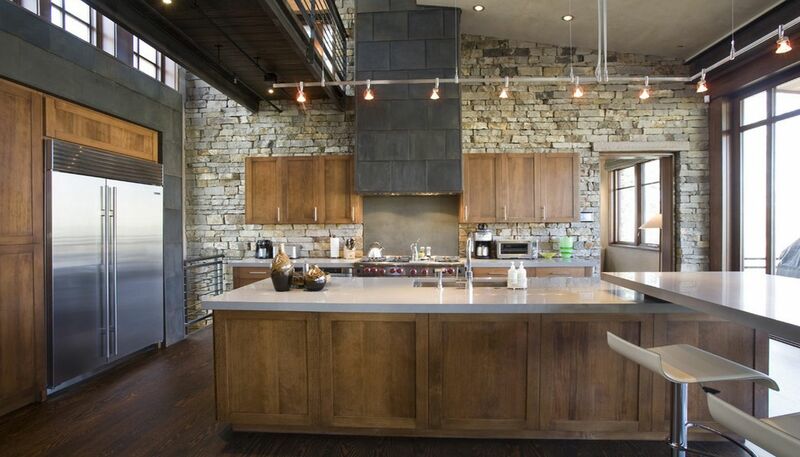 Another example of decorating with stone not only the space around the work area but also the furnace surface. This country-style design elements are, as they say, on a knife edge, very close to the rustic style. And it is difficult to come up with more suitable interior for a country house kitchen. This furnace finishing in gray-brown stone with snow-white grout organically fit the interior of light modern kitchen, which countertop repeats shades of stone facing. Even in small kitchens can be found a place for decorative stone finishing of surfaces. Sometimes the stone acts as focal center of kitchen space, but sometimes it prepared for the role of a neutral element or background for brighter objects. The kitchen island is in focus in this kitchen. And a stone decoration of the space around the plate and extractor hood was necessary only to harmonize with ceramic “metro” tile lining the splashback. 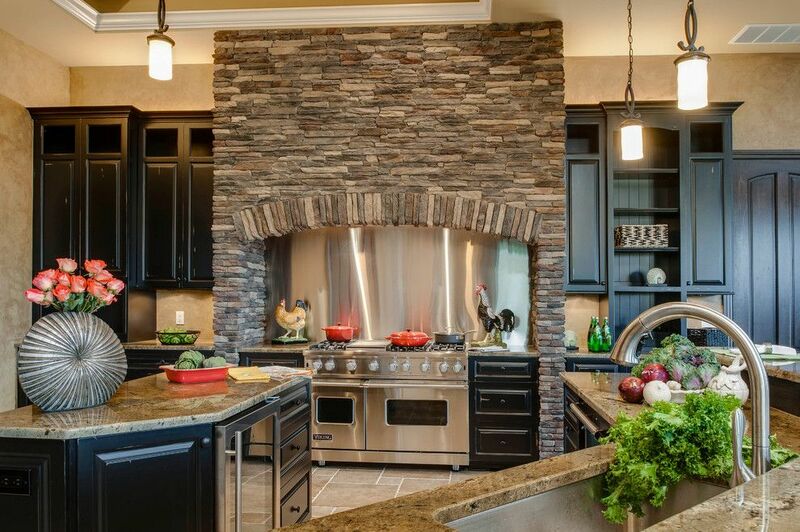 In this eclectic kitchen with a variety of colors and textures, stonework has become part of an impressive composition which appeared around working area. Bright stone contrasting with dark grout looks very dressy, attractive, indeed, like the entire kitchen interior. Ceramic tiles with an unusual pattern, shiny items on household appliances, wooden carved cabinets – everything is working to create a festive, welcoming atmosphere. It is not often we can meet facing surface of the work area in such a rustic, rough manner in the space of the classic kitchen interior. The tap built into the wall above the stove for cook convenience is not immediately visible behind the stonework. But the housewife has no need to run towards the sink, which may be far enough in the spacious room. 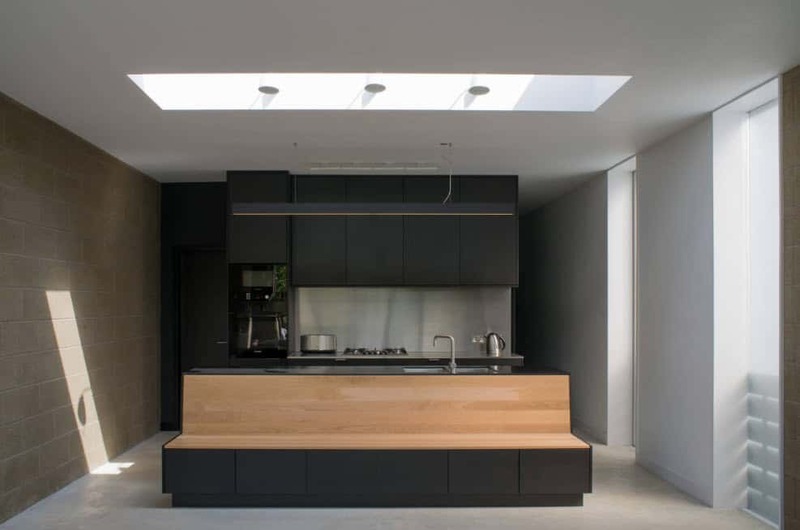 When in a modern interior, filled with shine of stainless steel kitchen appliances, appear natural materials – wood-beamed ceilings with wormholes and roughness, and the stone trimming of the space above the stove, the interior becomes incredibly interesting, non-trivial, memorable. Decorating the space above the working area in the kitchen-dining area is given special attention. Not only stonework, but the relief panels of ceramic tiles with painting became the decoration and focus center of the kitchen facilities. Pebble stone has become the star of this Country kitchen in red-gray colors. An interesting and at the same time harmonious neighborhood became the union of stone finishing and facing of the splashback using ceramic tiles in form of “herringbone”. Another example of an organic color combination of masonry and ceramic space finishing above the stove. In combination with the dark wooden kitchen set, construction looks fresh and festive. The contrast combination of light stone finishes and dark wood used in manufacturing of the roomy set of kitchen cabinets became the basic interior concept in the classical kitchen. All these nuances are reflected in the material of the kitchen backsplash, kitchen island tops and a dining table. Another image from the contrasting light sand shades of stone finish with dark wood tones of the kitchen cabinets and almost black counter tops. Forged elements on the chandelier and the extractor gave the medieval charm, the uniqueness of the old decor to the kitchen interior. An interesting design decision may be treating one of the walls of the kitchen area as accent surface. 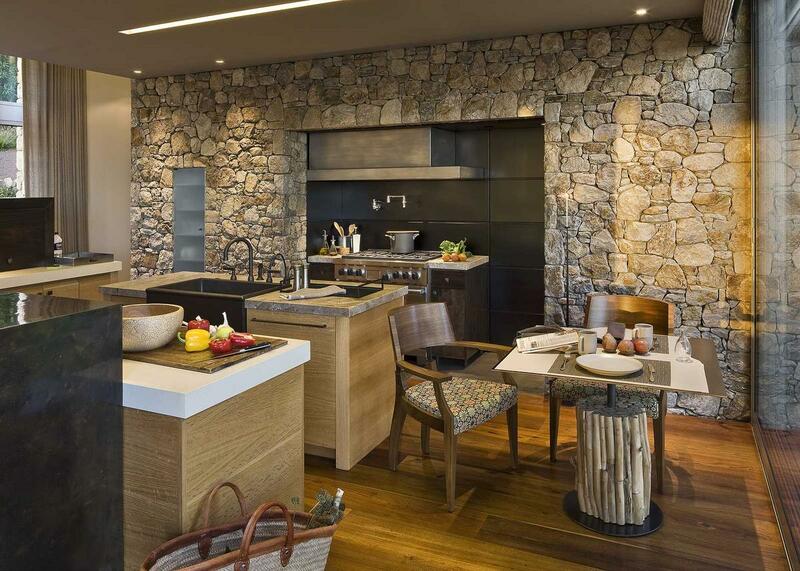 If the size of the kitchen allows, you can apply a stone finish and multiple surfaces. It all depends on the selected color palette, furniture arrangement, the abundance of natural and artificial lighting. An original way to furnish the space around the window is facing surfaces with pale stones of various colors. The stone wall became the backdrop for a small open shelves in the kitchen harmonizing with the main tone of the kitchen unit. As a result of the classic appearance of the kitchen acquired a certain rustic charm, but it has not lost heat of the color palette, because stone was picked up in the sand-beige color scheme. 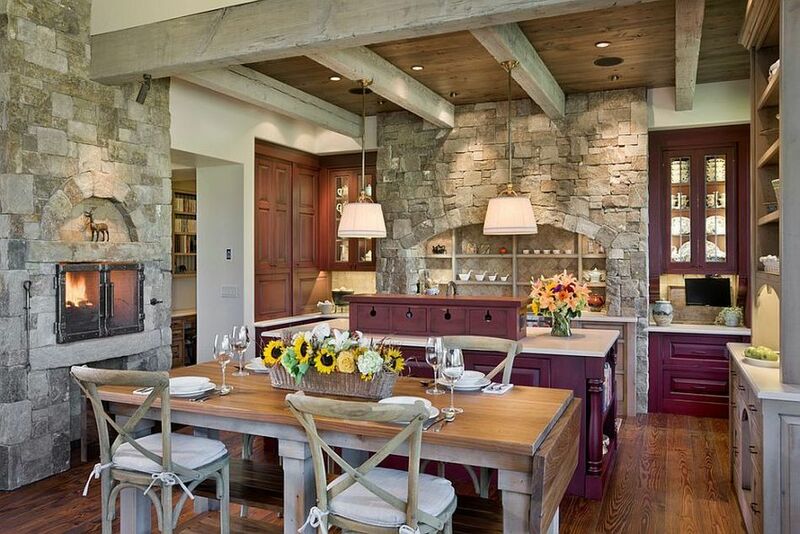 There are several walls are faced with minimally treated stone in this country kitchen. Light shade of natural material matches perfectly the color of wood, which used for ceilings and window frames’ execution. In combination with the mahogany made lower tier kitchen cabinets, the whole interior looks unique, attractive and comfortable. 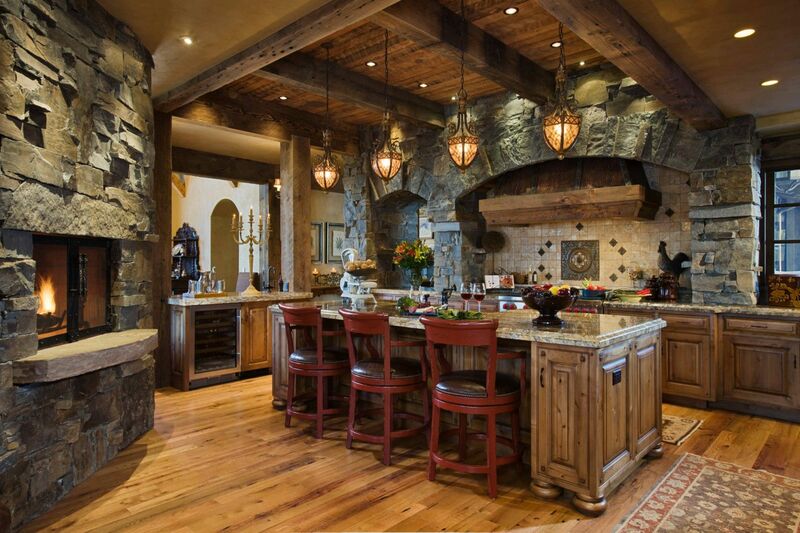 Rustic country with its traditional combination of stone and wood is reflected in this country kitchen. Warm-tan palette of the room creates a feeling of coziness and comfort of a home room for cooking and food intake. An interesting arrangement of a spacious area variant can appear a mixture of elements of the loft and country styles in the interior. Bright room with large windows can take not only the stone wall in rough, brutal execution, but also a kitchen storage of dark enough wood. When the dark-gray masonry on one hand and the unusual design of the relief surface decorated with wood on the other hand are meeting the glossy stainless steel within single interior – the resulting image can be very unusual, personalize and unique. Masonry looks incredibly appropriate representativeness and luxurious in combination with light types of wood and shiny steel and chrome elements of household appliances. The interior of this classic kitchen with elements of country reminds us of the times when stone was the most durable and affordable material for construction and decoration, and furniture for kitchen facilities was made entirely by hand, with an abundance of decorations and carvings. Even hanging lamps in this unusual kitchen premise is made with candles lighting imitation. You can hide not only the design of the hood, but also equipped with a backlight, which will bring even greater convenience in the cooking process with these stone lined constructions over the stove. The combination of stone and wood in the design of the space above the working area of ​​the kitchen can be an interesting design solution for modern facilities and bring a natural touch to the urban character of the premises. This eclectic styled kitchen is full of contrasts. Here we can meet the snow-white ceramic tiles as well as stone walls’ revetment, dark wooden elements and the combination of light and dark depths of colors of home appliances. 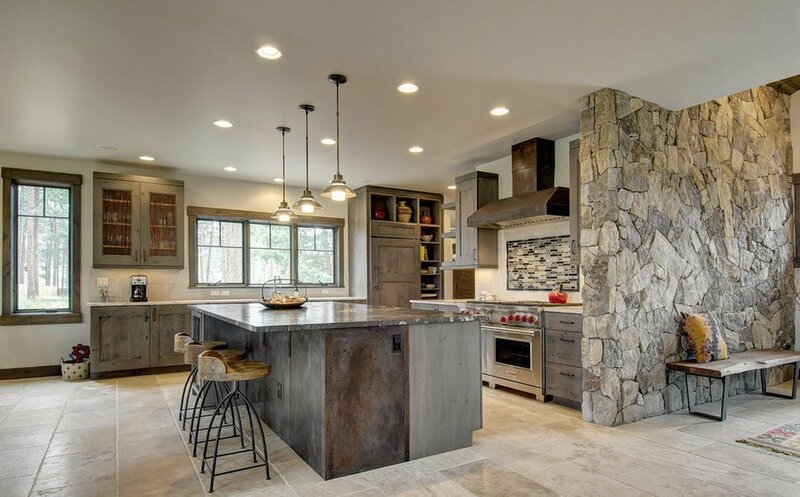 Rustic stone lining of one of the walls near the small kitchen in a bright color palette has become not only a focal area, but also its highlight, by diluting white surfaces interspersed with wood elements. 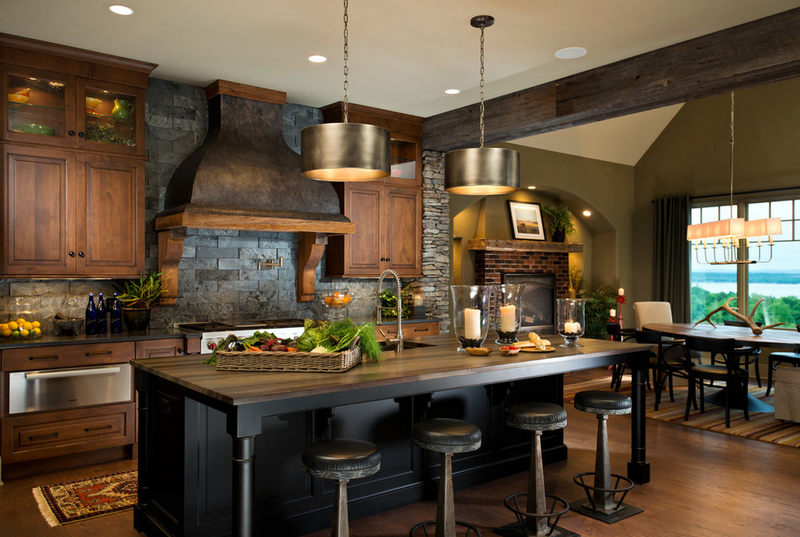 Another example of successful integration of rustic stone finish of one of the walls shows a design project of modern kitchen-dining room with a small area. The ultra-modern kitchen with a contrasting interior harmoniously adopted stone wall in gray and sand colors in its design. Original design became the idea of ​​integration of home appliances and TV-zone wall-screen between rooms. Another example of successful integration of stone finishes in the modern kitchen style inclined to minimalism. Almost a mirror surface of greyish floor and silver items of home appliances have become a link between the pure white gloss of the kitchen cabinets and roughness of ocher-gray stone. Cool kitchen palette, full of splendor of stainless steel and glass surfaces, took harmoniously stone finish of the walls with a contrasting dark grout. The modern interior did not lose its progressiveness, and became only more interesting, more unique. With the obvious variety of finishing materials – stone walls, wooden beams on the ceiling, a marble kitchen island and steel countertops, glass surfaces – kitchen still looks simple, concise and strict. Light sandy-beige stone with the same color of grout can be an excellent solution for wall decoration in a spacious kitchen-dining room with an eclectic design, which contains elements of both country items and stylistics of Baroque and Art Nouveau. Grey color of the stone is in perfect harmony with the reddish hues of wooden kitchen cabinets. The cool masonry palette compensates warmth of wood, creating an interesting look of a kitchen interior and bringing the difference in textures. We offer you several options for the design of kitchen space which realizes the original use of natural materials as the finishing of different surfaces – from the design of window openings to the base of the kitchen island. There is not only the flooring made of stone tiles, but also the base of the kitchen island is faced with a natural material. These spacious rooms with high vaulted ceilings can afford even some rustic style of of the room decorations. The design only wins of it. It becomes more original. 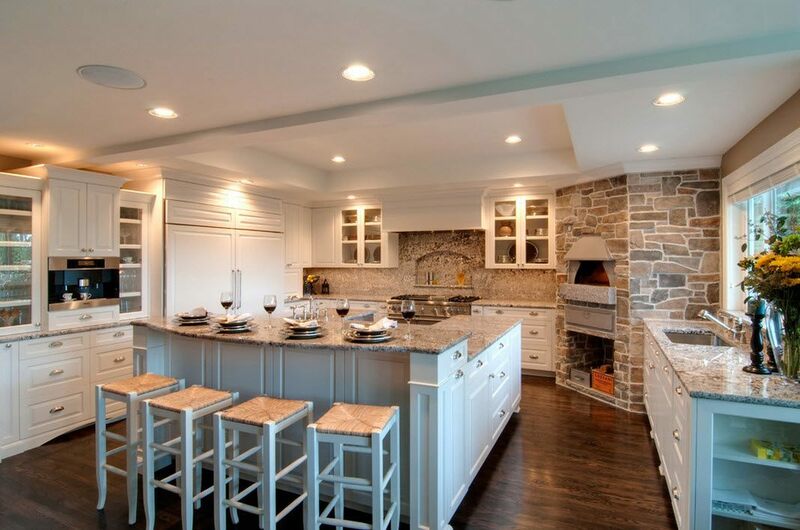 Another example of a kitchen island base decoration using stone cladding. This durable material can not only withstand the heavy marble or granite countertops, but also to decorate the interior. Decorating an archway by a stone in a light color palette brought even more patina of antiquity into the interior of the kitchen. It was also achieved by using carved wooden furniture, and wrought-iron lamps and decoration surface above the stove with stucco. 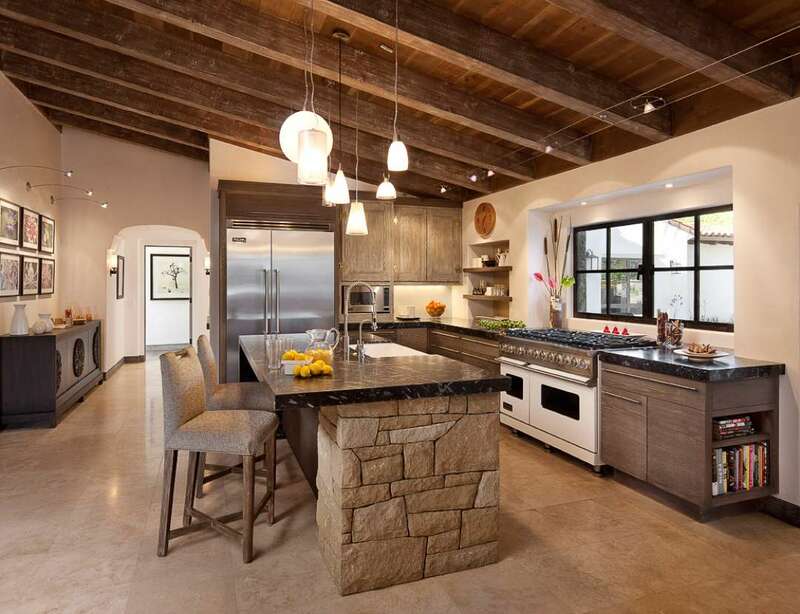 Stone finishing of the columns with niches with literally inscribed kitchen island counter, have become the original steel decoration of kitchen interior. The system built and pendant lighting not only provides the proper level of lighting, but also allows you to highlight interesting decor items. Bright palette of stone, which was used to face the column and the bar base, serves a contrast to the deep, dark tones of the kitchen units. Dark blue glass tabletops as inserts on the doors of kitchen cabinets became conciliatory option of the color scheme. Facing of only one column with stone of different shades became the color and texture fest of the classic kitchen, decorated with color gamma. The original decoration, not only brought a variety into a traditional setting of the kitchen, but also unified its interior. Here is a vivid example of how the working kitchen space area may become the center of attention. 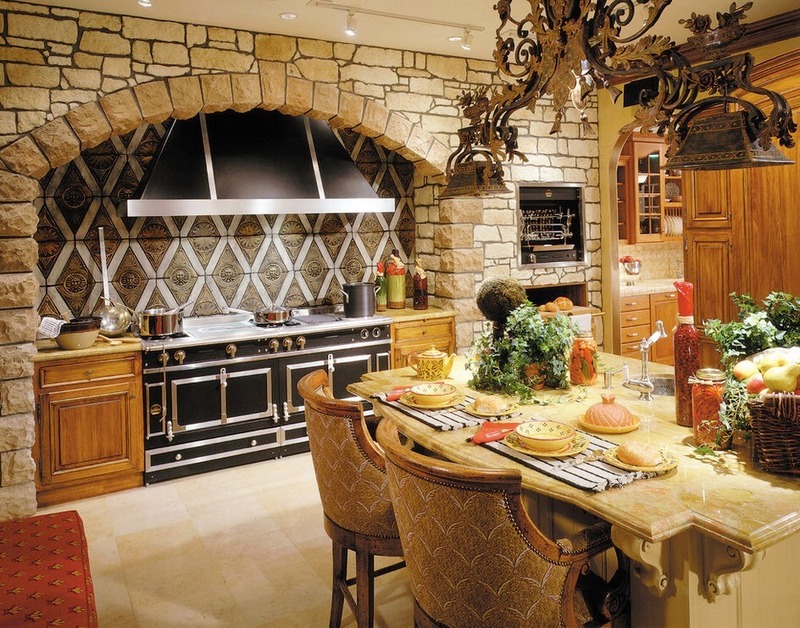 Stone finish of arched niches, ceramic tiles in patchwork style, luster of huge extractor hood – everything works to create a unique interior to attract attention. Small inclusions in the stone facing of the interior of the asymmetrical kitchen with an interesting ceiling design, have introduced in a variety of neutral decoration. Pinkish-beige shades surfaces are perfectly contrasting with the dark colors of kitchen cabinets. Curious where all of these photos come from. Not one photo is given credit. Whose projects are these?